What was it that the British people believed they were fighting for in 1914&#x2013;18? This compelling history of the British home front during the First World War offers an entirely new account of how British society understood and endured the war. 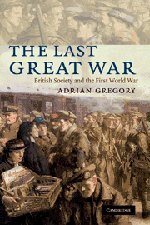 Drawing on official archives, memoirs, diaries and letters, Adrian Gregory sheds new light on the public reaction to the war, examining the role of propaganda and rumour in fostering patriotism and hatred of the enemy. He shows the importance of the ethic of volunteerism and the rhetoric of sacrifice in debates over where the burdens of war should fall as well as the influence of religious ideas on wartime culture. As the war drew to a climax and tensions about the distribution of sacrifices threatened to tear society apart, he shows how victory and the processes of commemoration helped create a fiction of a society united in grief.